Just when it seems there's nothing new to be said about the mega-subject of Tom DeLonge and his "To The Stars Academy," this turns up: The Case of the Missing Hot Dogs. We have received one loan from Our Two Dogs, Inc. (“OTD”) in two disbursements – one for $300,000 in April 2016 and another for $200,000 in March 2017 (see “Interest of Management and Others in Certain Transactions”). The note was amended on August 10, 2017 to provide for $300,000 to be provided in 2017, making the note agreement a total of $600,000. The note bears interest at 6% per annum and is due on December 31, 2018. In addition, the holder can require the note to be repaid prior to maturity in the amount equal to 10% of the net proceeds from any third party debt or equity financing. As of December 31, 2016, the principal balance of the April 2016 note was $300,000 with accrued interest of $13,512 due under then note. During the years ended December 31, 2016 and 2015, OTD contributed capital in the amounts of $183,184 and $329,994, respectively. The contributions were used within operations. Subsequent to December 31, 2016, OTD has provided a total of $257,000 to the company, $200,000 to fulfill the terms of the loan note and $57,000 for working capital. With the offering having raised thus far approximately $2,500,000, and with the offering of shares to end on September 29, 2018, it appears likely that $5 million will not be reached, and 10% of the net proceeds will go To The Dogs. As we just discussed, $50 million isn’t even enough to work on the projects they’ve highlighted in the letter, how would $1 million help? It wouldn’t help with anything other than paying back Tom for a “loan” he gave To The Stars in 2015 and 2016. But what in the world is "Our Two Dogs"? 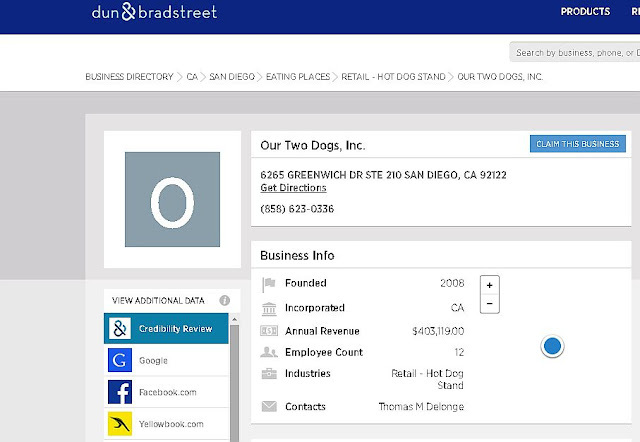 Dun & Bradstreet business listing for "Our Two Dogs." A retail Hot Dog Stand. Contact person: Thomas M Delonge. To the Stars Academy employees less people (3) than the hotdog stand and is being loaned more cash from the hotdog stand than it generates as revenue (not profit) in a year. Key Personnel of "To The Stars". Louis Tommasino is the Chief Financial Officer. Surprisingly, Yelp (on-line customer reviews) in San Diego has no listing for "Our Two Dogs." You can find "Hot Diggety Dog," "Wobbly Wieners," and pages of other hot dog vendors listed. "Our Two Dogs" does not seem to have any customers, or any retail location, yet reportedly employs twelve people and has a revenue of over $400,000 a year. Something about this is not right! Since this is not terribly far from where I live, I went down to 6265 Greenwich Drive in San Diego, which is in the business park area of the Sorrento Valley. The suite number of Our Two Dogs, 210, indeed takes you to the offices of Louis Tommasino, CPA, who is the Chief Financial Officer of To The Stars Academy. I walked into the office holding a copy of Dun & Bradstreet's report on Our Two Dogs. I began by handing the receptionist my card, and asking her about the supposed hot dog stand. A gentleman overheard what I was saying, and came over. I showed the report to him, and asked "where are the hot dogs?" He looked somewhat perturbed and said, "There are no hot dogs, this is not a hot dog business. Dun and Bradstreet is garbage, you insult me by bringing that in here." I asked him if he was Mr. Tommasino, he replied that he was. We moved briefly into a small conference area, and another employee of his joined us. I mentioned the loan payment that To The Stars will make to Our Two Dogs from the money raised by selling shares, and it quickly became apparent that Tommasino was unhappy with this line of inquiry. "Dun and Bradstreet is garbage, everyone knows they are garbage." The other employee agrees, they are garbage. (Dun and Bradstreet is, of course, the largest and most respected source of business information in the United States and in many foreign countries, founded in 1841.) "You insult me by bringing that in here." "Our Two Dogs is a management company, a highly respected management company, that I have operated for many years," he said. Sensing that there was no point in further discussions, I began to walk out. "Do you have any other questions? ", Tommasino asked, obviously quite perturbed. I pointed to the Dun and Bradstreet report (prompting another complaint that I am "insulting" him), and asked, "Is the $400,000 number correct?". "No." "Is the 'twelve employees' correct?". "No." "If you have any other questions, you can ask my attorney" (name mentioned, but no contact information given). "And my attorney will sue you if you write that this is a hot dog business." He need not worry - I am happy to report that Our Two Dogs is not a Hot Dog company. I did not mention it at the time, but some other business information sites, such as Buzzfile and Manta, also say that Our Two Dogs is in the hot dog business. Reportedly, Our Two Dogs is listed as a "limited-service restaurant" in the NAICS (government census) database. Bizapedia and Corporationwiki have the registration information for Our Two Dogs, but do not state what the business of the company is. They place the corporation's founding in 2000, not 2008. It occurred to me that DeLonge may have described his business as a "hot dog stand" just as a joke. If so, he should realize it is a bad idea to make jokes in financial filings. 2. Mr. Tommasino (and by implication, Mr. DeLonge) are quite unhappy with someone looking into this matter. an inactive company used as a vehicle for various financial maneuvers or kept dormant for future use in some other capacity. The entire UFO community is now deeply indebted to you although many will revile you for doing excellent detective work. I say this as a former detective sergeant and fraud investigator. I salute you and I can tell you that you have confirmed what my instincts have been screaming. Marc D'Antonio just did an excellent analysis of the two Hoopla videos based upon how a FLIR camera unit really works. This truly the age of Gaslighting in the UFO field which is a strange reflection of the national political scene. Shell companies are not necessarily illegal. I guarantee that there are more than quite a few shell companies out there owned by more than quite a few entrepeneurs. It's almost par for the course. That may be true but I am just not seeing the business of Dun and Bradstreet being a completely invalid source of information, or the "talk to my attorney" when we are supposedly dealing with a "public benefit" corporation designed to liberate mankind from conventional technology and UFO secrecy. The best I can do is quote Alice in Wonderland - "Curiouser and curiouser." I love other video analyses I've seen of that guy's in the past. Googling his name ("Marc D'Antonio") with "FLIR" and/or "DeLonge" and/or "hoopla" didn't turn up anything recent from him, though. It would be awesome if you could share a URL for what you're referring to in your comment. Please? Thanks for highlighting this Bob. Whatever is going on here seems far removed from the musings of Mr. DeLonge prior to the launch of this company. 'To the Stars Academy of Arts and Science' is actually listed as a service company SERVICE - ALLIED TO MOTION PICTURE PRODUCTION there. I would guess that there are other facts to be gleaned from studying the full text of those documents that could well make Tommasino and DeLonge even more unhappy. I'm not saying this sounds like money laundering, but this sounds like money laundering. I've skimmed some of those SEC docs. A lot of the documents there read like an elaborate recording contract — negotiated to Tommy Boy's advantage in some pretty impressive ways. Basically T & A is nothing more than a music and movie production company. The different people on Tommy Boy's "Dream Team" are analagous to an "A & R Man", a "Marketing Guy", a "Producer" a "Stage Manager" and the big burly dude with all the tatts is, the "Security Guy". And of course, their credulous true believers in alien flying saucers target audience are the To The Star=struck "Groupies". "I would – perhaps unkindly – characterize DeLonge’s enterprise, at this stage of its existence, as a cunning appeal to people’s hopes for magical technological achievements (underwritten by some of their more naïve beliefs) as a cover for promoting his own goods. Prediction: if this company lifts off, it will be a vehicle for DeLonge productions, and for endless promises of amazing, always imminent, scientific breaksthrough, which will never quite materialize. You may or may not be astonished to learn that at the time of writing DeLonge had shifted round $2 million-worth of shares. I wonder if Leslie Kean has bought any of them. As the brokers are obliged to tell you, the value of your investment may reduce as well as increase. Caveat emptor, as they didn’t say on Atlantis." So far, not so far wrong I think – he smirked, like a self-satisfied cat. So far, we've had promises, overheated claims, and a rather strange refusal to release/reveal the supposed 'chain of evidence' that we'd all like to see. The only thing new to emerge (and that was from elsewhere, not TTSA) is that Fravor's wingman was a dame. Or broad, or frail, if you prefer. 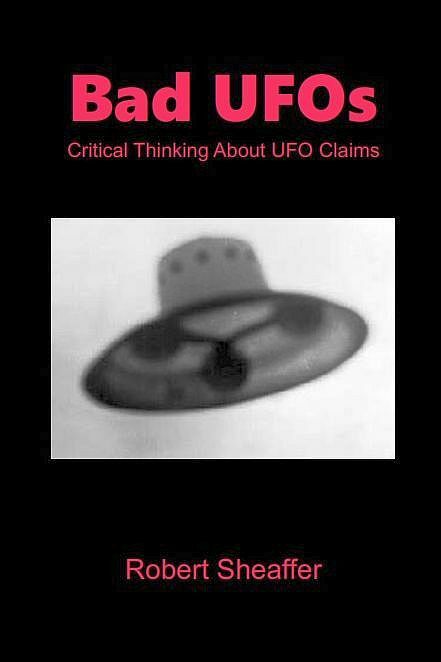 Ain't ufology grand [© Supreme Cdr Moseley]? What is most interesting, of course, is that the big showy To the Stars Academy is a glossy face on a network of other companies that seem to exist to push money back to DeLonge. More interesting is the fact that DeLonge’s business partners and employees don’t want to talk about the money or the relationship between the different companies. Generally, when a shadowy network of personal corporations are shuffling money around and don’t want to talk about it, the real story isn’t the official business of the companies but rather the money. No "they can't be Sirius" joke?